Ratio Beer Works is located just up the street from Our Mutual Friend Brewing Company, so I didn't think I could pass up the opportunity to visit when we were at OMF. As you may recall, this was the Wednesday night before Thanksgiving. 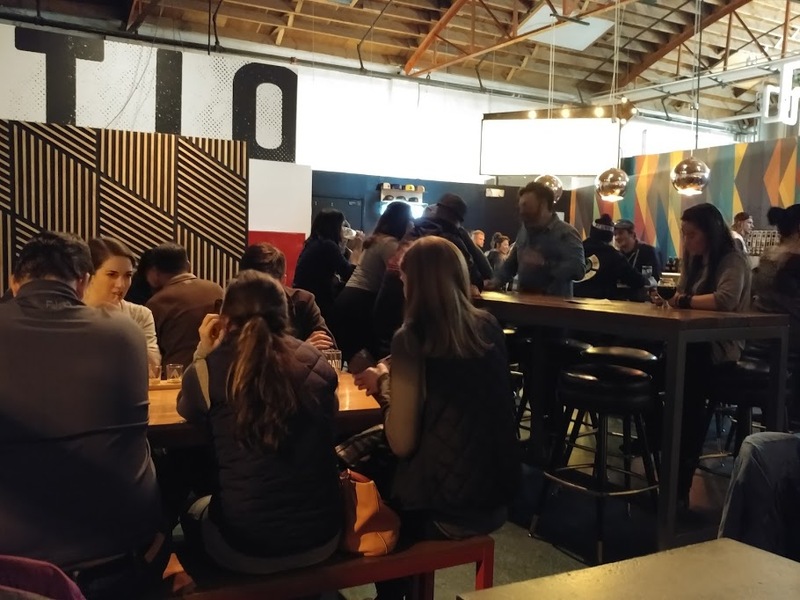 The address is 2920 Larimer Street in the River North area of Denver Colorado 80205. 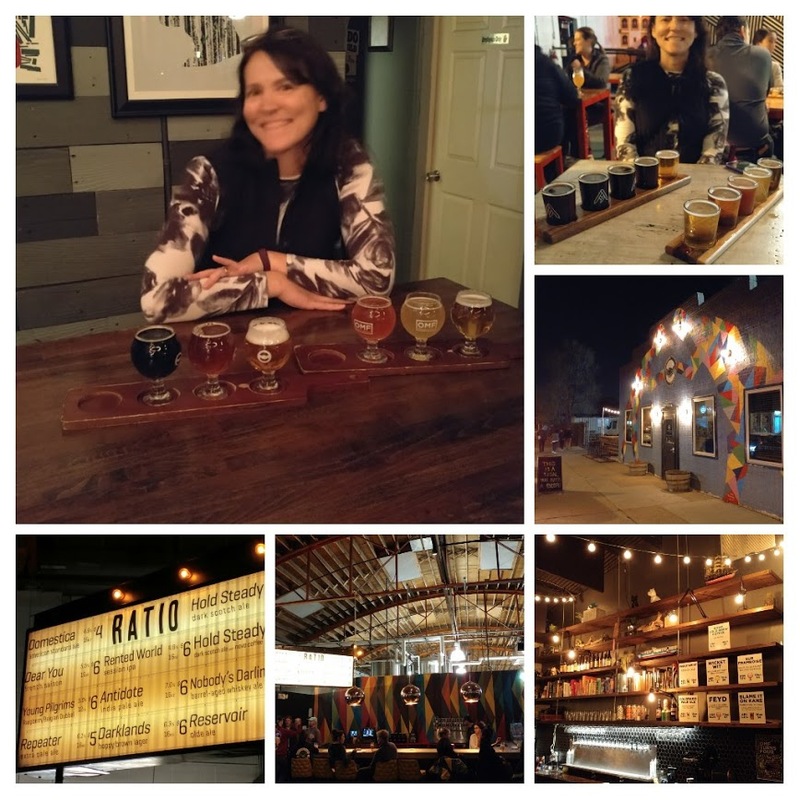 As I have mentioned before on this blog, there are several breweries in this area, so if you want, you can make a day of visiting a bunch in walking distance. Unlike OMF, was pretty busy on Thanksgiving - eve. It wasn't completely packed, but there were not a whole lot of tables for us to pick from. It was not nearly the laid-back atmosphere that we had just come from. Ratio also had more beers to choose from than OMF. The SheppyBrew Beer Model and I shared two flights of 5. Domestica ... A 4.9% abv American Standard Ale. A gateway beer with low bitterness and malt flavor. 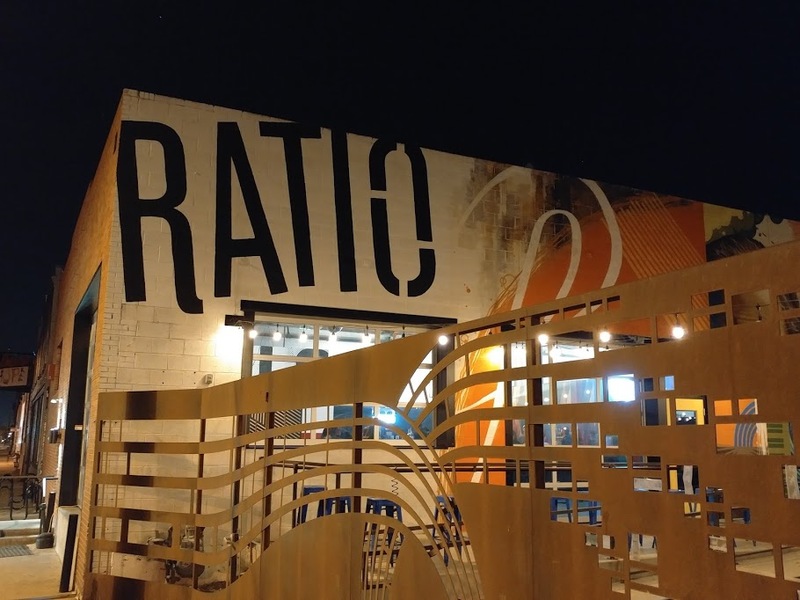 Ratio's answer for those who come in and say they want something like Coors Light. Dear You ... A French Saison. The flavor reminded me very much of the Seasonal Saisons I make at home. It does, however go Amerian on the hops using Citra, which makes for an interesting change in a Saison. Young Pilgrims ... I had to add this to Untappd and I don't see it on the Ratio website. It is a Belgian Dubbel with Raspberries. Not my favorite of the night, but interesting concept. 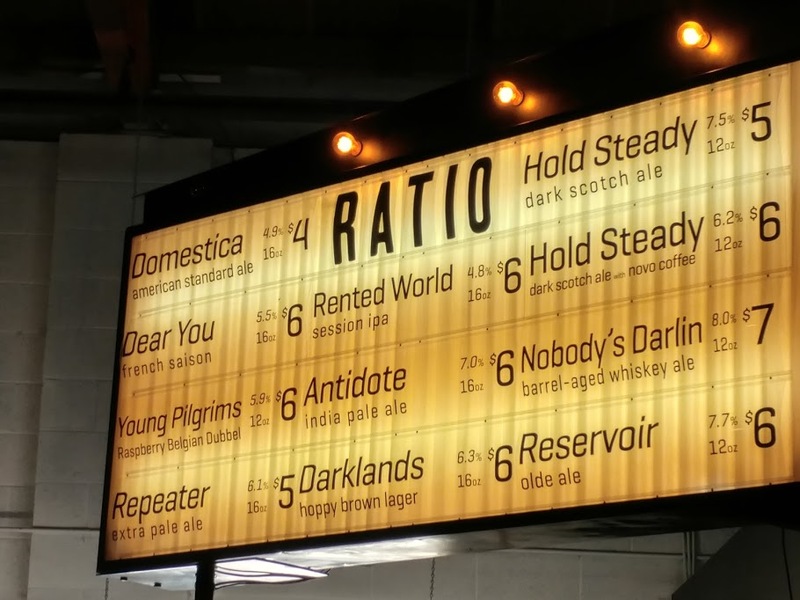 Repeater ... That "extra pale ale" ... right in between a pale and an india pale ale. Nice hops. Nice malt. 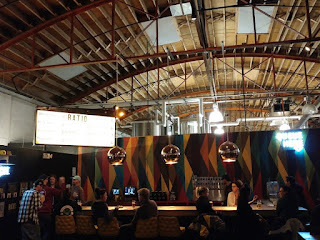 I think this was my favorite of the beers I had at Ratio that night. Rented World ... Has that typical "Session IPA" flavor. Piney citrus hops. Good stuff. Antidote ... 7% American IPA. The description calls it a West Coast IPA, but my notes indicated that I thought it could be hoppier. 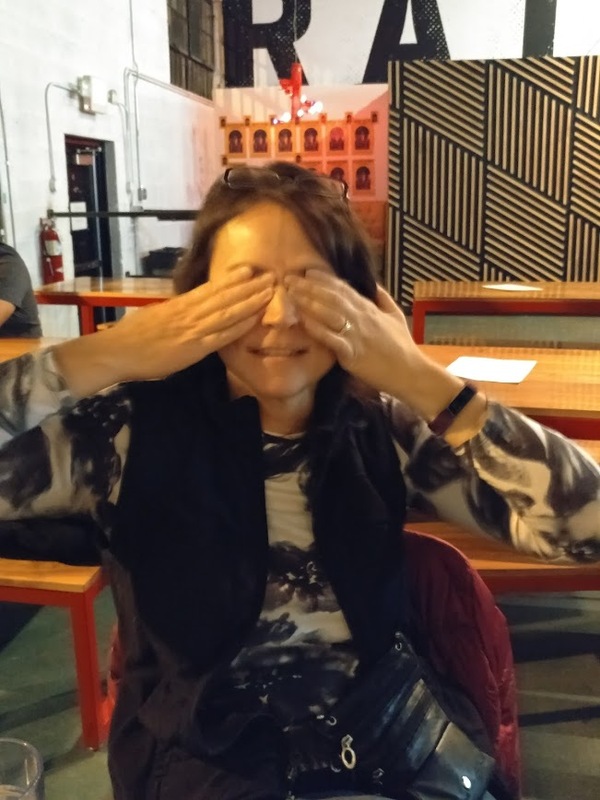 Not sure if I was just suffering pallet fatigue at that point, or maybe this batch is on the old side, but I would not categorize it as "West Coast" myself. Darklands ... The decription said "Hoppy Dark Lager". Again, I didn't think it was that hoppy. It was actually sort of sweet. Good dark lager, though. Notes of cocoa bean and dark toasted malt. Hold Steady ... 7.5% Chocolate Rye Scotch Ale. Way too smooth. 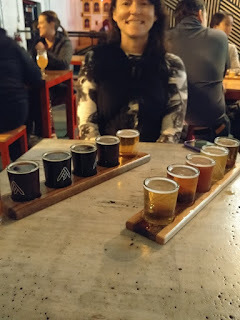 My one note on untappd was "Yummy". Hold Steady W/ Coffee ... Very much like "Hold Steady" only in addition to everything else going on with the beer, it had that nice firm expresso coffee flavor too. Awesome. Nobody's Darlin' ... Blend of a couple of Bourbon Barrel-Aged beers. I'm sure people who like this sort of thing love this beer ... however ... for me this style (and this beer) tastes way too boozy. We actually didn't even finish this taster. Reservoir ... An Olde Ale. Pretty good, but also high in alcohol. I thought I detected a bit of smoke in it. Good beer. 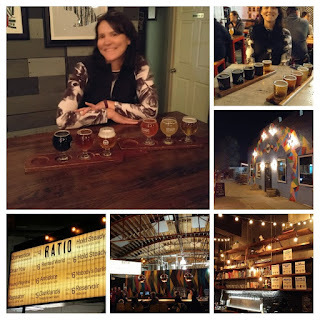 So, the beers were pretty good other than the one I thought was too boozy. Again, that is just me. People who like that Bourbon flavor in beer will like it. The energy in this place was fantastic. I was surprised how busy it was on Thanksgiving eve, and I imagine it would be even more so other times. I feel like I should go back sometime. I suggest you give it a visit too. Again, keep in mind that there are a bunch of breweries in this general area, so you might want to hit a couple at the same time. 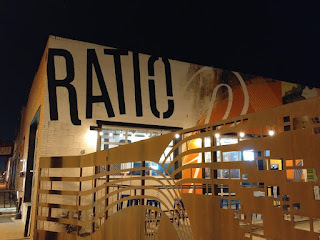 Ok ... that is it for R is for Ratio Beer Works. Up next in the series is "S". I have not picked one yet, and I have a bunch to choose from. 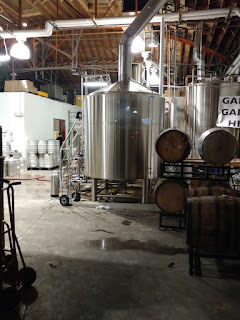 If you have a favorite "S" brewery, please leave a comment suggestion below.